Kristin Hein and Philip Cozzi, 508 Commercial Street, by David W. Dunlap (2013). Capt. Frank Rich did not have far to travel when he was the sexton of the Church of St. Mary of the Harbor. He lived here. After his death in 1946, the property passed to his niece Lillian Canavan and her husband, William. They opened the Old Homestead guest house in this property, which it remained at least until the 1960s. 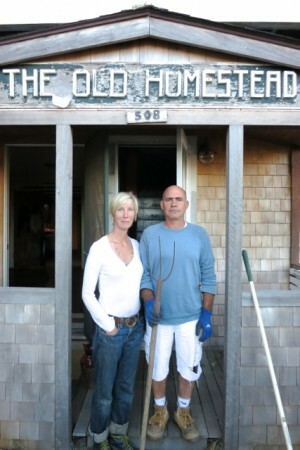 The designers Philip Cozzi, the nephew of Ciro Cozzi, and his wife, Kristin Hein (both pictured), acquired this building in 2013 and found, among other things, a full set of skeleton keys from the Old Homestead days, on classic diamond-shaped motel tags. They renovated and reopened the lodging in 2014. Robert Rufino, the interiors editor of Elle Decor, was their inaugural guest.